I’m doing a Big Year in 2017! In case I somehow I have not told everyone yet, I am planning on doing a birding Big Year in Ontario in 2017! I have been planning for it for over a year and whether I am fully prepared or not, 2017 is less than one day away and I’m getting excited! Many, many mornings will be spent behind my telescope at various shores. This is a photo of me birding the shore of Lake Erie at Point Pelee in autumn 2016. My goal is simple: to do the best I possibly can with the time, money, and skills I have at my disposal. As much as I would love to ideally beat the record, I am not overly concerning myself with that aspect of the challenge. If I give it my best shot and I beat the record, great! If I do my best and fall short of the record, then that’s great too. 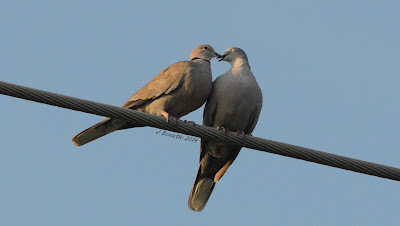 I'll be travelling all over the province, aiming to see virtually every breeding and migrant species, but there is of course no guarantee of success with every one of these species. 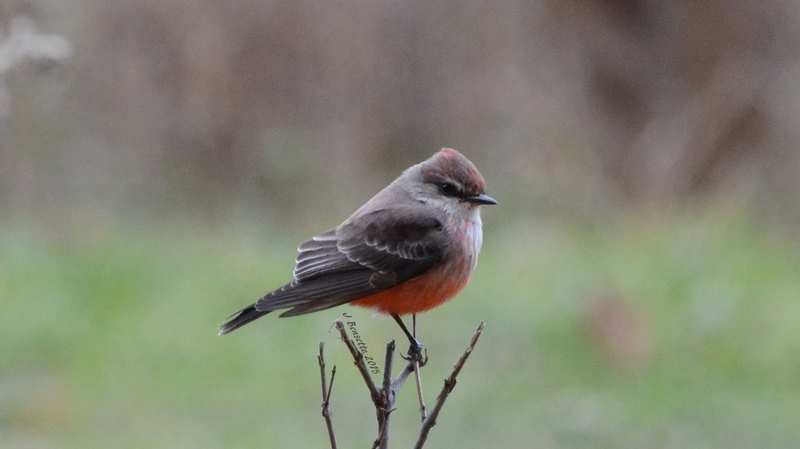 Another Vermilion Flycatcher in Ontario would be a great highlight for my 2017 Big Year! This is a young male that I photographed in Lambton County in winter 2015. Wondering what the current record is? 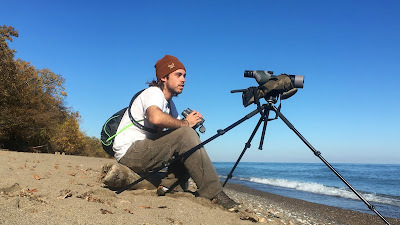 One of my best friends, Josh Vandermeulen, currently holds the Ontario Big Year record with 343 species identified in 2012. This number is no easy feat, and in fact I would argue that in certain select years it’s impossible for one birder to see that many species. For example, total number of bird species identified and listed in Ontario in 2014 was 347, so if someone wanted to beat Josh`s record they would have had to miss no more than three of all the species identified in the province that year! Josh took the record from Glenn Coady, who held a very impressive record of 338 for quite a few years from 1996 I believe, a time before mass media like Facebook, thousands of participants in email alert services like Ontbirds, and frequent text messaging and photo sharing. My fingers are crossed that 2017 turns out to be a pretty strong year for bird species in Ontario, but that aspect is out of my hands for the most part. 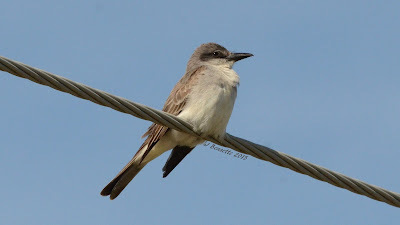 Will I have the chance to see a Gray Kingbird in Ontario in 2017? This is a photo of one that I found in the Point Pelee area with Emma Buck and Dave Ehrenreich in spring 2015. Why a Big Year in 2017? Well, why not? 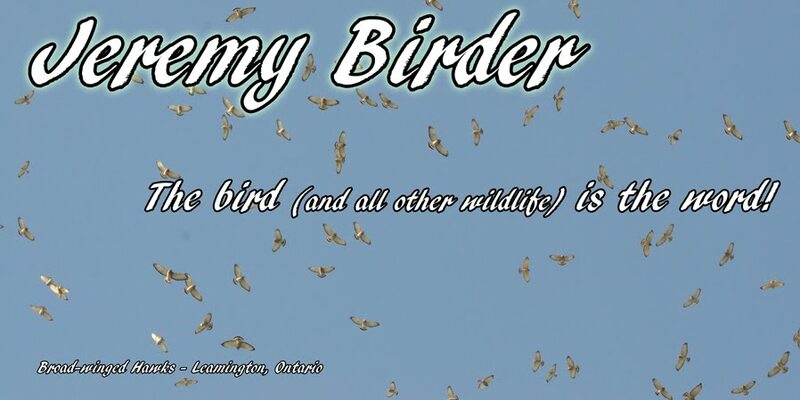 We cannot possibly know ahead of time if a year will bring great fortune to Ontario's bird watching community or not, so if one wants to do a pretty serious Big Year, he or she really has to just pick a year, plan it out, and go for it. I'm quite young still and full of plenty of energy (not saying that I do not have energetic friends much older than me, but I don't know if I will be as I age!). I am also at a point in my life that I need to take on more steady work in the near future as my expenses grow, which would greatly compromise an all-out Big Year. I've needed some practice to really hone my knowledge and skills, hence why I have waited this long. This might come as a surprise to some, but I have only been bird watching for about five years. To attempt a Big Year with less experience than I have now seems like an idea I would have regretted. This coming year has been in careful planning for over a year, and now it's almost here! Eurasian Collared-Dove would be a great addition to my 2017 Big Year! This is a pair that I found near Leamington with the help of Michelle Valliant and Jeremy Hatt in summer 2014. Hopefully I can find some time to update my blog somewhat regularly, so anyone interested has a convenient channel to follow along with my adventures. I like to think it will provide some friends and family with entertainment, and maybe even some vicarious birding opportunities to those who are not able to get out often enough themselves! Purple Sandpiper is a regularly seen species in Ontario but can be an easy miss in a Big Year if I'm not careful! This is a pair that I found at The Tip of Point Pelee in autumn 2013. There it is - my official announcement that I'm about to begin a Big Year in Ontario. I wish anyone reading this a happy and prosperous new year, whether it involves bird watching or not. See you in the field! This is virtually an identical article to the one I submitted to the recent edition of Toronto Entymological Association's newsjournal called Ontario Insects and Essex County Field Naturalists' Club newsletter called The Egret. Enjoy! October 29, 2016, marked a very significant milestone in my naturalist career... When I went out that morning, I had no idea that I would find the first record of the butterfly species Goatweed Leafwing (Anaeas andria) for Canada! My first view of the Goatweed Leafwing at Point Pelee. Wow! I was walking alone around lunch time in the Red Cedar savannah habitat of Sparrow Field near The Tip of Point Pelee National Park, only about 15 minutes after my friends and I parted ways for the afternoon. While studying the various insects that were nectaring on some of the remaining goldenrod (Solidago) and knapweed (Centaurea) flowers, I noticed an interestingly shaped orange and brown butterfly flying erratically. It eventually landed, revealing itself as unlike any butterfly I had seen before. This was a great rush, as I know my local butterflies quite well and therefore knew this had to be something pretty rare. I managed to fire off a quick photo of its open wings just before it flushed, landed, and flushed again. It landed on some vines in a dead tree a few metres off the ground, and had I not seen it land it would probably have never been refound! It sat between grape leaves for about an hour with closed wings no matter how close we stood under the tree, which I hear is rather unusual for this species. This is the Goatweed Leafwing with its wings closed. An aptly named species! After making a few phone calls, a number of my nearby friends arrived in a hurry to see the mystery butterfly. 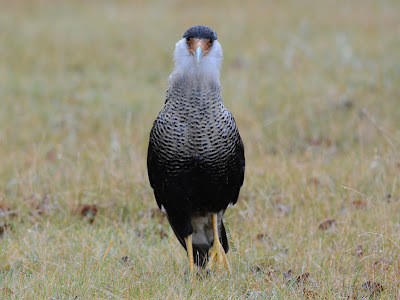 Luckily Steve Pike was able to help me identify it with his mountain of experience with wildlife south of here. It eventually opened its wings to gather some energy from the sun then made another short flight, landing between some vegetation and dead leaves at the edge of the beach. At this point it was pretty apparent that this individual was rather exhausted as it barely held itself upright in the subtle breeze. We all left in the early afternoon, taking careful note of its location, but were unable to refind it for Bob Curry later in the afternoon after an extensive search. That was the last confirmed sighting of this wayward visitor. The gorgeous view we enjoyed while the Goatweed Leafwing tried to warm up in the slight sunlight. Although this is an unprecedented find in Canada, this southwestern stray was certainly bound to be found here eventually. The BAMONA (Butterflies and Moths of North America) database lists 16 records of this species within 500km of Point Pelee, the closest by far being a record from Washtenaw County, Michigan, only ~150km away. It also lists at least 19 records further north than Point Pelee, all being west of here. This species is known to feed on Goatweed (Capraria biflora), Texas Croton (Croton texensis), and Prairie Tea (Croton monanthogynus) – the latter two found in localized patches in nearby states. The night and morning before my find delivered pretty strong southwest winds of 17-37km/h, likely leading this butterfly across Lake Erie and into Point Pelee. 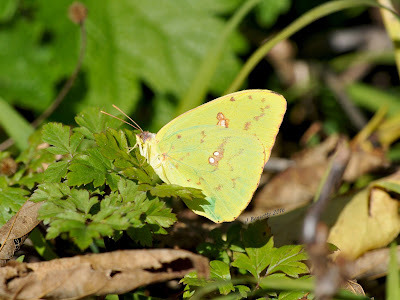 As if the Goatweed Leafwing was not enough, as my friend Jeremy Hatt arrived I spotted a Cloudless Sulphur (Phoebis sennae), also somewhat rare to Canada! Needless to say it was quite the afternoon at Point Pelee. Dan Greenham and I went on to find two to three individuals of this species on November 18, absolutely destroying the previous late record for Canada! This is another Cloudless Sulphur we found at Point Pelee on November 18 - record late for Canada! I was of course feeling the spirit of one of my best friends, the late Alan Wormington, that day as he was incredibly talented and renowned for finding rare butterflies and moths in this area. To add to this feeling, the next day (October 30, 2016) I stumbled upon an online posting of finding of the ABA's (American Birding Area) third ever record of Amazon Kingfisher at Zacate Creek in Laredo, Texas. What is the significance and/or relevance of this find to this post? Well this Amazon Kingfisher was found in the exact same place that Alan found the first ever ABA sighting of this species in January 2010! I should add that Alan was notorious for making the drive between Texas and here in record time, and the timing is about right on for him to have made it from Point Pelee yesterday to Laredo today. We'll be reminded of Alan time and time again through our sightings. Alan taught me to always persist, to be honest, to be hard on myself, and to be proud of what I know and do. I, along with so many friends, am so proud to do my best to carry on his legacy. Keep hiking and searching, and searching, and searching, and you never know what you may stumble upon! Crazy Chase Season 2016 - there's more! 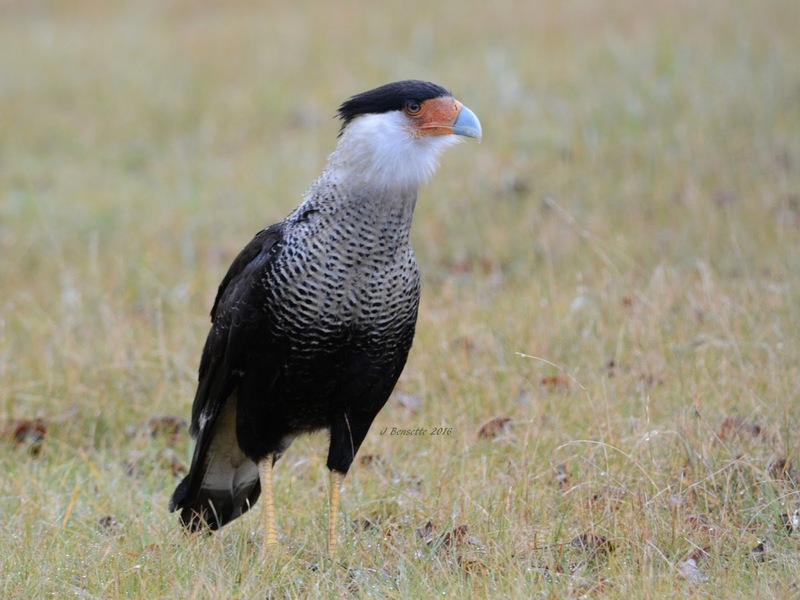 Crested Caracara anyone? 1) The bird is new to my Ontario list. 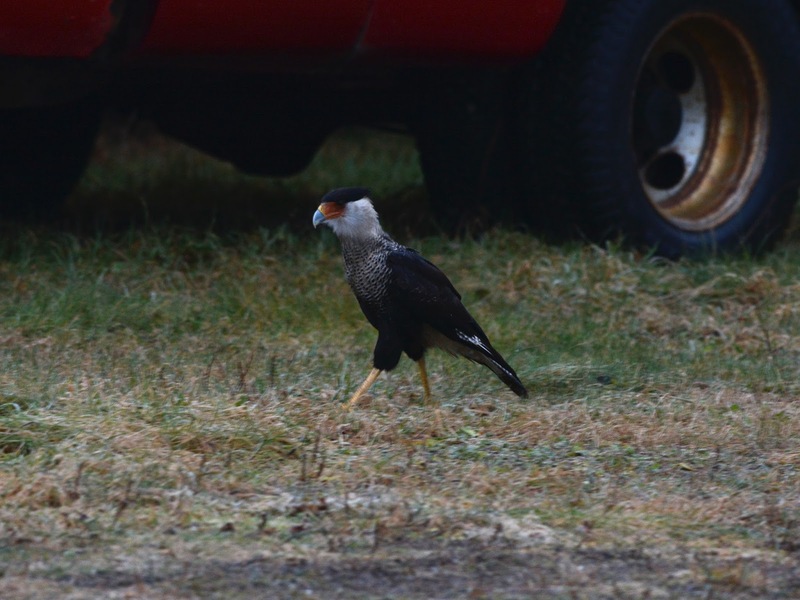 2) The bird is really, really rare and I may not have a chance to chase another one next year. It all began with a guy named Chris Eagles at an MTO (Ministry of Transportation Ontario) aggregate pit near Wawa, Algoma District, on the east coast of Lake Superior. He noticed a funny looking hawk-like bird picking through some fishing scraps near his work site on November 28. It seemed accustomed to the nearby workers and machinery so he got close enough to capture an identifiable photo with his cell phone and posted it on his Facebook page. Joanne Redwood, a birding friend of mine, happened to come across this photo on November 29 and immediately shared it with the Ontario Birds Facebook group. Why? 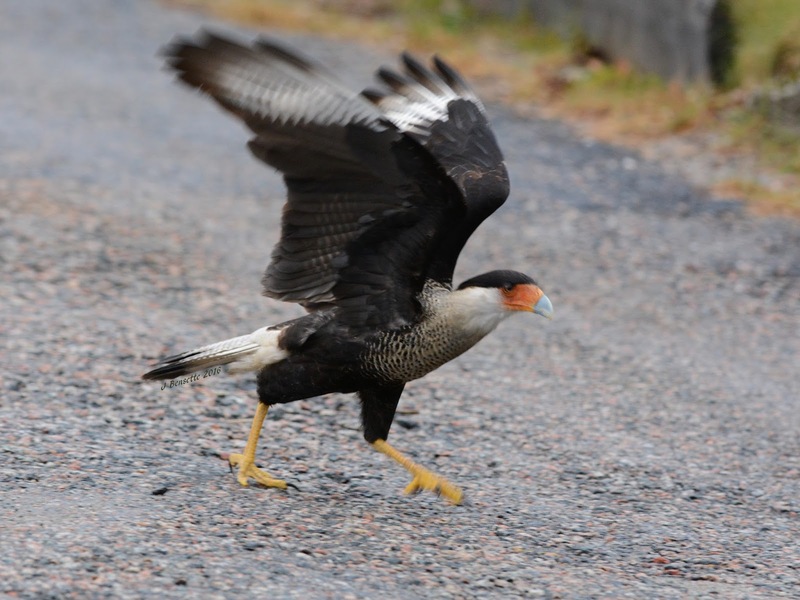 It was a wild Crested Caracara in Ontario!! I was one of the first birders to notice her reposting of Chris's sighting and immediately began asking him questions and planning my route to Wawa. I posted Chris's sighting on his behalf to the Ontbirds bird alert then called a handful of close birding friends to see if they too were interested in chasing it. Within a few hours we had plans for two full vehicles to make the journey. I immediately got in touch with Josh Vandermeulen of Niagara, Henrique Pacheco of Toronto, and Steve Charbonneau of Erieau. Steve would have normally opted to travel through Michigan as it would save him and I nearly four hours each way, but he had just forfeited his near-expired passport in order to process a new one less than an hour before I called him! This worked out well for all of us, because I had already arranged to meet Josh and Henrique on the Ontario route. I met up with Steve in Kent County in the evening and we picked up Josh in Guelph and Henrique in Toronto on our way around Lake Huron. To get therein about 13 hours we drove non-stop except for food and fuel, while keeping in touch with our friends Barb Charlton, Tyler Hoar, and David Pryor who were also en route from the Toronto area. The seven of us arrived at the outskirts of Wawa by sunrise. Steve, Henrique, Barb, and I planned on looking for as long as three days for this rarity, but the others needed to pin it down the same day or they'd head home empty-handed. We checked the places it had been seen the day before like the entrance to the MTO pit and the lawns of various nearby businesses - no luck. Josh, being familiar with the villages surrounding Wawa, suggested we try searching the small First Nation village of Michipicoten. 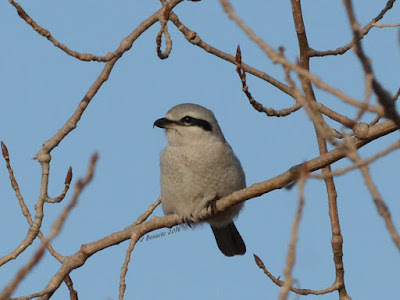 Half an hour into our search we had already stumbled upon a Northern Shrike, my favourite of the world's bird species, as well as flocks of Common Redpolls and Evening Grosbeaks. If I recall correctly, Josh made a left hand turn as we rolled into the town and casually exclaimed "There it is." I think Josh was in shock! We were so fatigued and expecting a lengthy search that it took the rest of us a few seconds to realize what was going on! The car irrupted with sounds of excitement, inappropriate language, and very slow camera shutters due to the early morning light. Barb, Tyler, and David rolled in shortly after we called them and we all celebrated this special sighting. 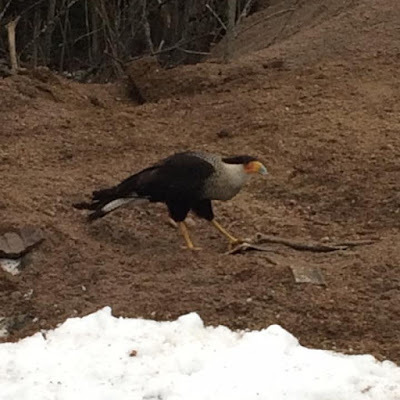 While we watched it, the Crested Caracara pulled a few worms from the soil and ate some food scraps on a lawn before flying into a spruce tree. Tyler, knowing how much this species loves eating roadkill and garbage, tried to coax it back out of the tree by tossing the following on the ground: 1. his orange hat, 2. his own body, 3. a road-killed Gray Squirrel he found earlier. Even birds with the filthiest of diets like vultures and caracaras have standards, so obviously it didn't go for Tyler's bait! ;) It eventually flew down to a driveway so we hopped back in the cars and enjoyed it through the windows. I find that birds are most nervous when they see our legs and feet, so we didn't want to risk scaring it away. Crested Caracara head-on view reminds me of Secretary Birds from Africa! The other three started their trip back south and Steve, Henrique, Josh, and I stuck around for another half hour, immortalizing this visitor in the form of very sharp close-up photos. 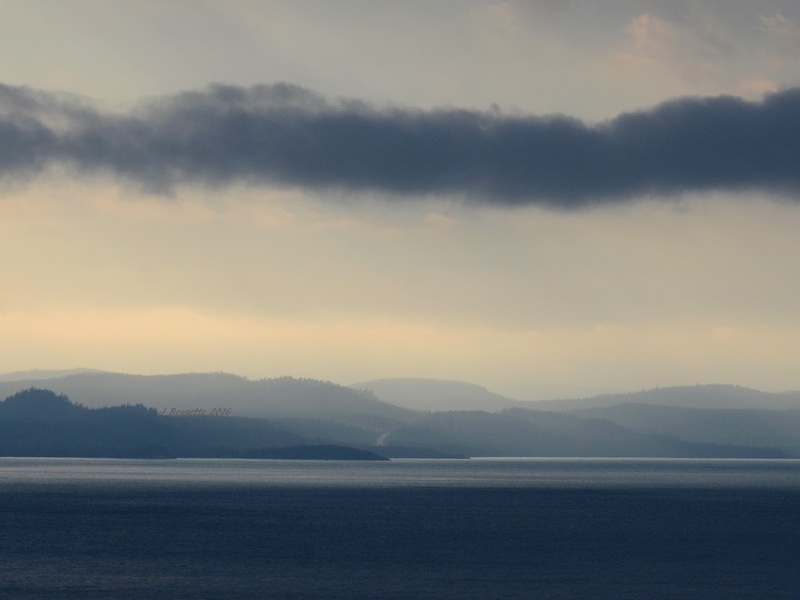 We left for home by mid-morning, stopping a couple of times to enjoy the scenery seeing as this was Henrique's and my first visit to Lake Superior. 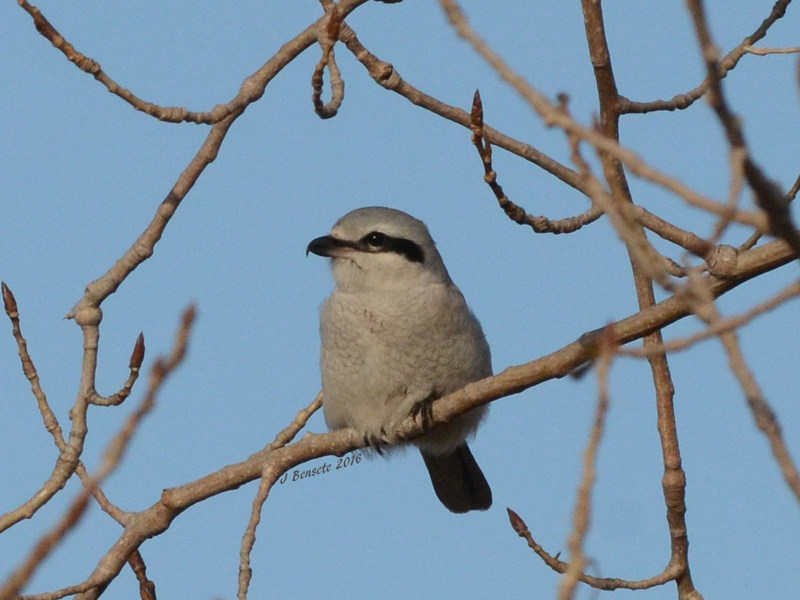 We ended up seeing two more Northern Shrikes along the way and had a very energetic and fun time driving back after such a successful chase. I was back home, barely awake, just after midnight. Some readers might be wondering why we assume that this individual is naturally wild and not some released falconry bird or somehow transported here. I suppose there is little to know way to be 100% sure that any raptor, common or not, is an escaped pet or of questionable origin, but this is not a desirable species to falconers, and random long distance vagrancy in Crested Caracara is not without precedence. 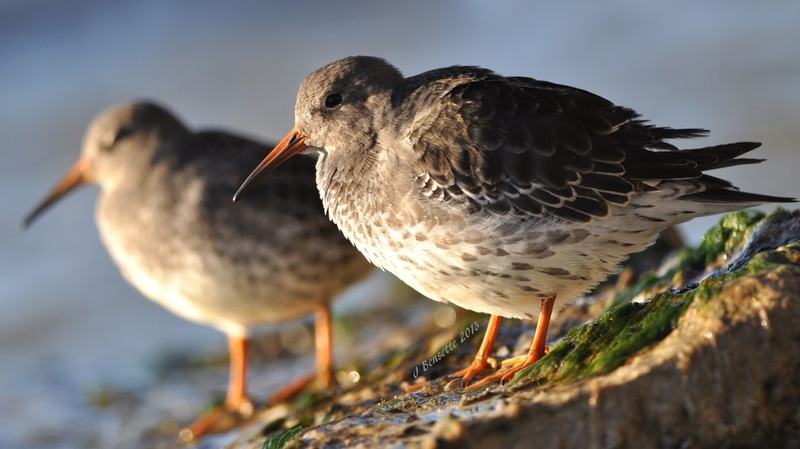 There are three prior records in Ontario, contributing to a total of as many as 15 records across Canada (depending on which separate records might be the same bird), 11 of which occurred in the last six years. This would be only the eighth ranking northernmost record for this species, so it's clear that they have a pattern of far northbound vagrancy, especially in recent years. 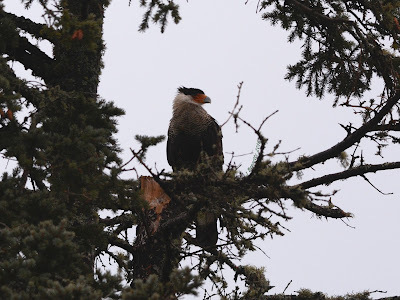 I think this sighting of a Crested Caracara is probably my most exciting bird sighting in Ontario to date, maybe aside from some self-found rarities. It is from very far south of Ontario, is a very large, colourful, and unique looking species, and was teasing us for months while it was fed and photographed by many birders in the Upper Peninsula of Michigan from July until mid November (The finer details of its plumage strongly suggests that this is the same bird that had been watched nearby in Michigan for months). From what I gather, this was the first time a Crested Caracara has ever been photographed and chaseable in Ontario and only Ontario's fourth ever documented record. We are very excited to have been the group who spear-headed chasing it! 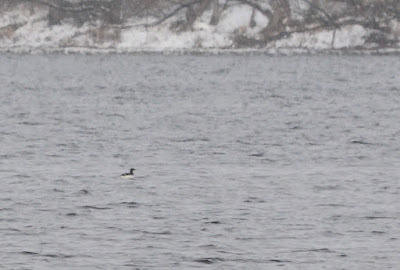 It was pleasing to see reports of other birders re-finding it for days after us, and it sounds like it was present in Michipicoten until the evening of Tuesday, December 6. I can't get enough of these Crested Carcara photos! It's now a few weeks later and my heart still pounds harder every time I think about that adventure. I have no doubt that I would have been racing up there with Alan if things went a little different this year. I miss him. 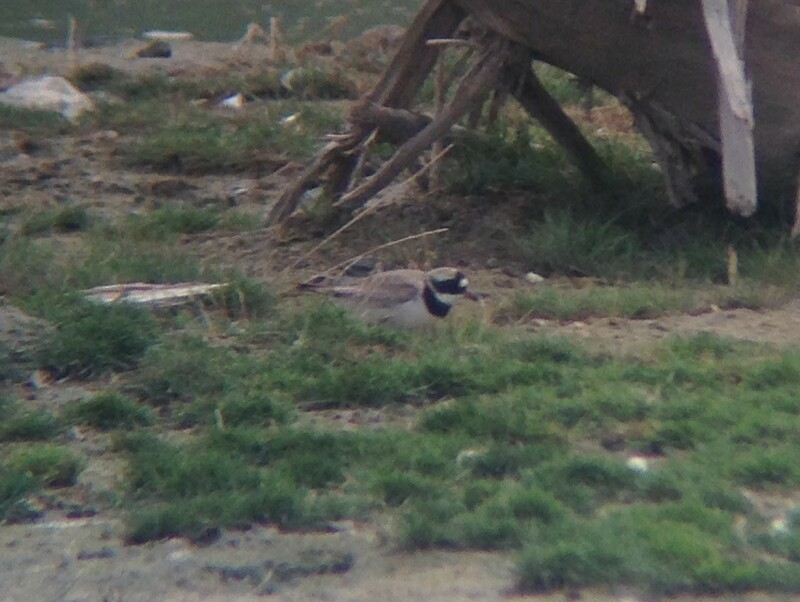 2) The bird is really, really rare and I may not have a chance to chase another one for a number of years. There was one crazy rarity in the late fall that was very worth chasing: Ontario's first Common Ringed Plover, found by Paul Prior at Tommy Thompson Park on August 20. Needless to say, Emma and I got there pronto and eventually spotted it after two hours of nearly hopeless searching! Most of the fall season went great as far as relaxing while birding goes, with quite a few lower priority rarities showing up here and there. I abided by this rule without any problems through the months of September and October, but by mid November. 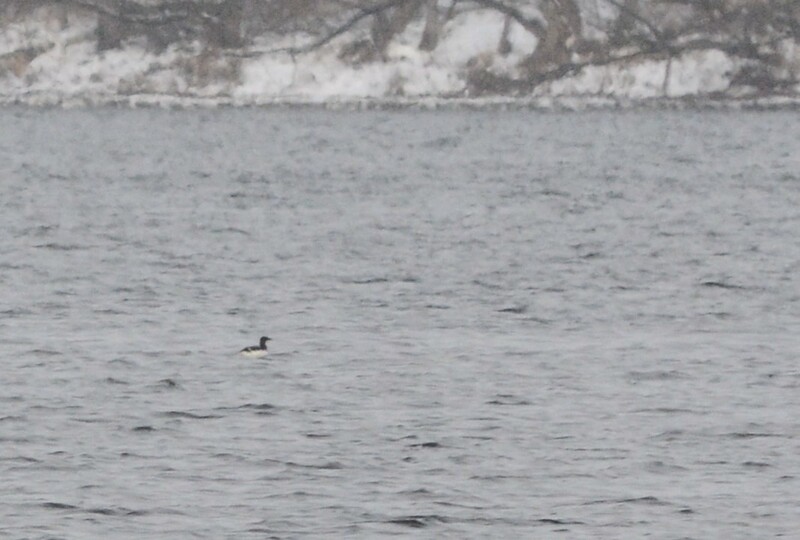 In late November, a Thick-billed Murre was found on Muskrat Lake in Cobden, Renfrew County, by Burke Korol. All bets were off on my bird-chasing hiatus, and I left the Point Pelee area by supper time, stopping to pick up my friend Henrique in Toronto, and we headed toward Ottawa! We slept in the car for what felt like fifteen minutes (about five hours) and by about 9 am the following morning we met up with my good friend Josh and we shared super views of the pretty black and white alcid (murres, puffins, auks, etc. belong to the avian family called Alcidae). This was a new species to my world life list as well, which made it slightly more exciting still. To be frankly honest, it wasn't the closest view (at least a few hundred metres away) and the best photos we could manage were only identifiable at best, but the excitement of seeing it far outweigh the poor quality views and photos! I've never had a chance to watch any alcid dive and swim on somewhat calm water, so it was a lot of fun watching it seamlessly dive very differently than any diving ducks. It was apparent from before it got under the water that it was relying heavily on its wings to act as flippers. With that said, I think my highlight of the trip was finding a Barred Owl in the early morning in Hastings County! 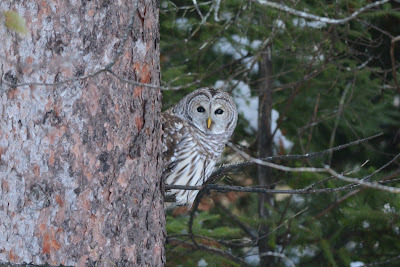 This was only the second time I've seen a Barred Owl in Ontario, as they are not known to live in Southwestern Ontario, my home. This was the first self-found Barred Owl for both Henrique and I, and we were spoiled with a great roadside photo op. 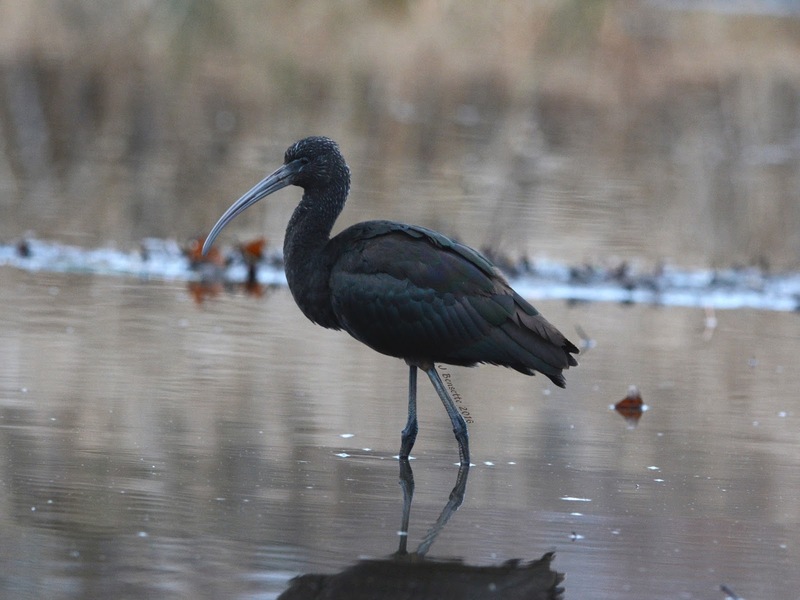 Later in the day on our way home, we received word of an immature Plegadis ibis in Port Hope, found very recently by Margaret Bain. Yeah we took a bit of a detour! It was hanging out in a small sewage runoff pond in a park along Lake Ontario, and obliged for some pretty super photos! This individual looked mature enough to comfortably assign it the species taxa of Glossy Ibis due to its evenly coloured legs, bluish facial skin near the eye, and clearly defined white lines on its face, but there's no denying that many immature Plegadis individuals cannot be reliably identified. I was back home only a few hours later than when I left the previous evening! Not bad for my first chase in a couple months!